This collection is all about sharing precious moments over a meal or drink using locally made and inspired homewares. 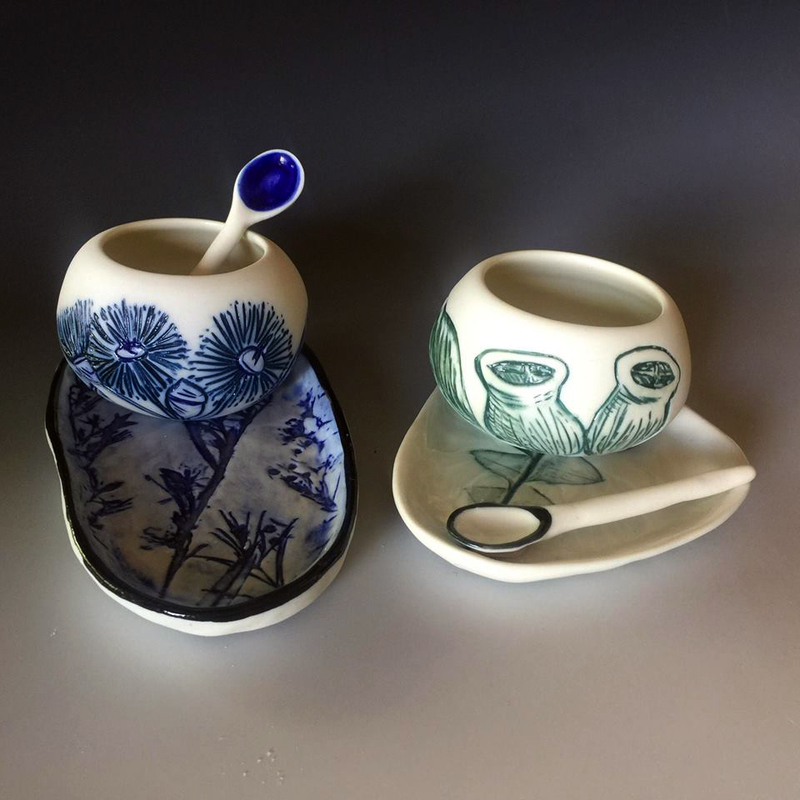 Made with Southern Ice Porcelain Clay, these pieces are all very strong, a beautiful crisp white, and are finished with a sanded soft feel on the outside and glazed within. Dishwasher and microwave friendly. These works all have either engravings or paintings of the Eucalypt in different stages if blossom and bloom. A few select pieces also have little Australian birds. 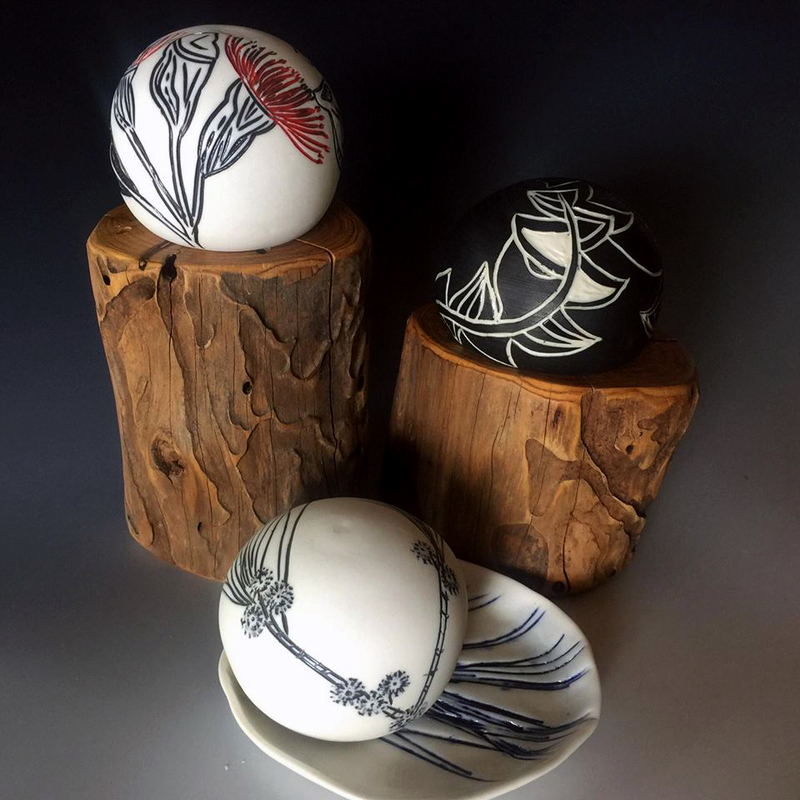 These unique porcelain salt shakers are handmade on the potter’s wheel and decorated with inlayed Australian plant designs such as Sheoak and Banksia leaf. They are double walled with a small funnelled spout inside and a small pinch sized opening, allowing just the right amount of salt through. When gently shaken side to side the salt can’t tip out, only when shaken in a gentle up and down motion, or tipped upside down and back, does the salt come out. It is ideal for coarser salt, for a larger ‘pinch’ use finer ground salt, or you can even use pepper or other spices. To refill simply tip upside-down on a slight angle and slowly pour a small amount of salt down the funnel while giving it a slight giggle, so that the salt travels up the inside walls. It holds a moderate amount and the beautiful form fits perfectly into the hand. Celebrate with your friends and family in unique Australian style with your very own collection of multifunctional porcelain homewares inspired by our stunning flora and fauna. These striking objects, made by hand, explore my love of nature and the land. They feature the Eucalyptus in different stages of growth and bloom. A few select pieces also have some stunning little Australian Birds. These wares are versatile, unique and multi-functional. Made with porcelain clay, they are robust enough for everyday use, can be used with hot or cold foods or beverages, and are dishwasher and microwave safe. Enjoy, adore, treasure; and Rediscover Ceramics.